Stoborough: A stunning and rare opportunity to purchase this farmhouse estate which comprises a six bedroom detached house, three bedroom detached bungalow and land with potential for development subject to the usual consents. Situated in the popular village Stoborough, 1/2 a mile walk from Wareham, close to local schools and amenities. Bungalow: "Stoborough Farmhouse Lodge" has been architecturally designed and built to allow for additional conversion to living space in the upstairs (stpp). The property comprises entrance hallway, living room, kitchen, utility area, separate WC, boot room, three double bedrooms, family bathroom and further separate WC. Further benefits include gas central heating, double glazing throughout, garden, garage and parking for numerous vehicle at the front. Double glazed wood window facing the side, radiator, carpeted flooring, built-in storage cupboard, painted plaster ceiling, original coving, ceiling light. Double glazed wood window facing the front, vinyl flooring, painted plaster ceiling, original coving, downlights, roll top work surface, wall and base units, one and a half bowl sink, space for oven, over hob extractor, integrated dishwasher, space for fridge/freezer. Double glazed wood window facing the front, radiator, vinyl flooring, painted plaster ceiling, original coving, ceiling light, roll top work surface, base units, one and a half bowl sink, space for washing machine. Vinyl flooring, painted plaster ceiling, original coving, ceiling light, low level WC, extractor fan. Sliding double glazed door opening onto the patio, double glazed wood window facing the rear overlooking the garden, radiator, carpeted flooring, painted plaster ceiling, original coving, ceiling light. Double glazed wood window facing the side, radiator, carpeted flooring, painted plaster ceiling, original coving, ceiling light. Double glazed wood window facing the front, radiator, carpeted flooring, painted plaster ceiling, original coving, ceiling light. Double glazed wood window with obscure glass facing the side, radiator, carpeted flooring, painted plaster ceiling, original coving, ceiling light, low level WC, wash hand basin. Double glazed wood window facing the side, radiator, carpeted flooring, textured ceiling, original coving, ceiling light, low level WC, panelled bath with mixer tap, single enclosure shower, wash hand basin with mixer tap, extractor fan. Front is laid to gravel with parking for numerous cars. The rear garden is laid to patio and gravel with flower beds around and partially enclosed by timber fencing. Farmhouse: "Stoborough Farmhouse" would benefit from some renovation to bring this former profitable bed and breakfast back to glory. Totalling an impressive 3200 sq. Ft, this property needs to be seen to be fully appreciated. 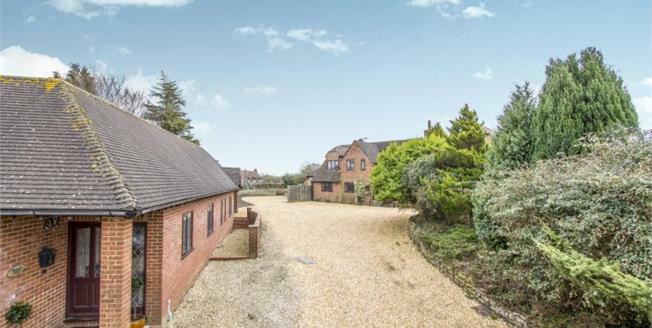 The property also comes with an adjoining plot of land which has huge potential for development (stpp) offering an interesting opportunity for a family purchase that could suit all needs. Currently ground floor accommodation comprises entrance hallway, living room, dining room, study, snug, kitchen, kitchen-diner, utility room and wetroom. First floor provides six double bedrooms, en-suites to five bedrooms including the master and a separate bathroom. Further benefits include two working boilers, double glazing throughout, side and rear garden, large workshop, double garage and parking at the front for numerous vehicles. Double glazed wood windows facing the front, solid wooden front door, radiator, carpeted flooring, painted plaster and vaulted ceiling, wall lights. Double glazed wood windows facing the front and side and rear overlooking the garden, radiator, carpeted flooring, open fireplace, painted plaster and feature timber beams, wall lights. Wooden French double glazed doors opening onto the patio, double glazed wood window facing the rear overlooking the garden, radiator, carpeted flooring, open fireplace, feature timber beams, textured ceiling, wall lights. Double glazed wood windows facing the rear and side overlooking the garden, radiator, carpeted flooring, feature timber beams, textured ceiling, wall lights. Wooden French double glazed doors opening onto the patio, radiator, carpeted flooring, textured ceiling, original coving, wall lights. Double glazed wood window facing the front, tiled flooring, part tiled walls, textured ceiling, ceiling light, low level WC, wash hand basin. Double glazed wood window facing the front, tiled flooring, part tiled walls, textured ceiling, ceiling light, roll top work surface, wall and base units, one and a half bowl sink, integrated oven, gas hob, over hob extractor, space for fridge. Double glazed wood window facing the front and side, radiator, tiled flooring, timber and textured ceiling, original coving, downlights, roll top work surface, wall and base units, stainless steel sink, space for oven, gas hob, space for dishwasher, space for fridge/freezer. Double glazed wood window facing the rear overlooking the garden, wooden door opening onto garden, tiled flooring, textured ceiling, ceiling light, roll top work surface, wall and base units, double sink, space for dishwasher, space for washing machine, dryer. Double glazed wood window with obscure glass facing the side, tiled flooring, tiled walls, textured ceiling, ceiling light, wet room style shower area. Double glazed wood velux window facing the front, carpeted flooring, textured ceiling, ceiling light. Double glazed wood window facing the front, radiator, carpeted flooring, a built-in wardrobe, painted plaster ceiling, feature timber beams, wall lights. Double glazed wood window with obscure glass facing the rear, radiator, carpeted flooring, painted plaster ceiling, wall lights, low level WC, panelled bath with mixer tap, wash hand basin with mixer tap. Double glazed wood window facing the front, radiator, original floorboards, part tiled walls, textured ceiling, ceiling light, low level WC, single enclosure shower, wash hand basin. Double glazed wood window facing the rear overlooking the garden, radiator, carpeted flooring, textured ceiling, wall lights and ceiling light. Double glazed wood window facing the rear overlooking the garden, radiator, original floorboards, textured ceiling, ceiling light. Double glazed wood window facing the rear overlooking the garden, carpeted flooring, textured ceiling, ceiling light, low level WC, single enclosure shower, wash hand basin, extractor fan. Double glazed wood window facing the rear overlooking the garden, radiator, original floorboards, painted plaster ceiling, wall lights. Vinyl flooring, painted plaster ceiling, wall lights, low level WC, single enclosure shower, extractor fan. Double glazed wood window facing the rear overlooking the garden, radiator, original floorboards, painted plaster and timber ceiling, wall lights. Radiator, carpeted flooring, textured ceiling, ceiling light. Low level WC, single enclosure shower, wash hand basin, extractor fan. Double glazed wood window facing the front, radiator, original floorboards, painted plaster ceiling, feature timber beams, wall lights. Double glazed wood window with obscure glass facing the side, radiator, vinyl flooring, textured ceiling, ceiling light, low level WC, single enclosure shower, wash hand basin. The front is mainly laid to gravel with access around leading to the rear garden, this is laid to lawn with area patio areas and surrounded by mature bushes and trees. A double garage is situated next door.